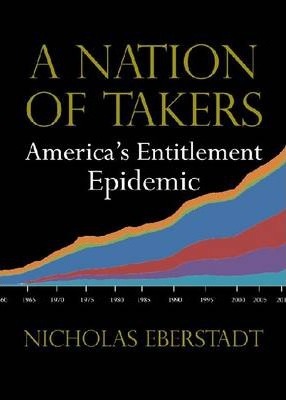 In A Nation of Takers America s Entitlement Epidemic, one of our country s foremost demographers, Nicholas Eberstadt, details the exponential growth in entitlement spending over the past fifty years.As he notes, in 1960, entitlement payments accounted for well under a third of the federal government s total outlays. Today, entitlement spending accounts for a full two-thirds of the federal budget. Drawing on an impressive array of data and employing a range of easy- to- read, four color charts, Eberstadt shows the unchecked spiral of spending on a range of entitlements, everythingfrom medicare to disability payments. But Eberstadt does not just chart the astonishing growth of entitlement spending, he also details the enormous economic and cultural costs of this epidemic. He powerfully argues that while this spending certainly drains our federal coffers, it also has a very real, long-lasting, negative impact on the character of our citizens.Also included in the book is a response from one of our leading political theorists, William Galston. In his incisive response, he questions Eberstadt s conclusions about the corrosive effect of entitlements on character and offers his own analysis of the impact of American entitlement growth. Nicholas Eberstadt, a political economist and a demographer by training, holds the Henry Wendt Chair in Political Economy at American Enterprise Institute. He is also a senior adviser to the National Board of Asian Research, a member of the visiting committee at the Harvard School of Public Health, and a member of the Global Leadership Council at the World Economic Forum. He researches and writes extensively on economic development, foreign aid, global health, demographics, and poverty.William A. Galston is a political theorist. He holds the Zilkha Chair in Governance at the Brookings Institution. In addition he is College Park Professor at the University of Maryland. He was a senior adviser to President Bill Clinton on domestic policy. Yuval Levin is the Hertog Fellow at the Ethics and Public Policy Center, founding editor of National Affairs magazine, and a senior editor of EPPC's journal The New Atlantis. His areas of specialty include health care, entitlement reform, economic and domestic policy, science and technology policy, political philosophy, and bioethics. Mr. Levin served on the White House domestic policy staff under President George W. Bush focusing on health care as well as bioethics and culture-of-life issues. Mr. Levin previously served as Executive Director of the President's Council on Bioethics, and as a congressional staffer.